Do I need a bunded tank, and how do I know? What materials are plastic tanks manufactured from? Should I replace older metal tanks? How close to a flue outlet can I place an oil tank? Can I install a tank in a building, garage or shed? Can I fit the tank myself? How can I locate an OFTEC registered installer? There is a two pin type socket fitted to my oil tank. What is this for? Is an Apollo fuel level monitor compatible with a Watchman Unit? Do you sell gravity feed kits for the delivery of diesel fuel? Can I store and dispense Kerosene (C1/C2) from your fuel stations? What liquids are Fuel Stations, Fuel Points suitable for storing and dispensing? Are the flow meters fitted to your fuel dispensers suitable for the resale of fuel? I want to transport some diesel between sites, what tank do I need? A Single Skin Oil Tank consists of a single container in which fuel is stored. Unlike Bunded Oil Tanks and Bunded Fuel Tanks, Single Skin Oil Tanks incorporate no secondary containment whatsoever and in the event of a spill, a pollution incident will occur. 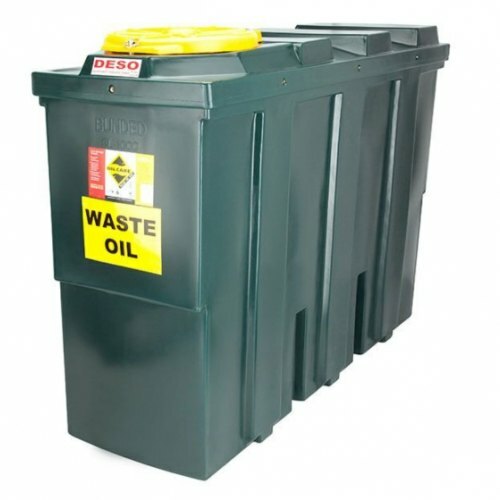 Single Skin Oil Tanks are not suitable for the storage of fuel at commercial, industrial or institutional premises; or at domestic installations with an installed capacity of over 2,500 litres - unless installed within a suitably bunded area. For all other installations, an Oil Tank Risk Assessment must be undertaken by a competent person prior to installation and in accordance with the requirements of OFTEC Technical Instruction Book 3. In anticipation of future possible regulations, serious consideration should be given to fitting a Bunded Tank, even where a single skin tank may currently suffice. A Bunded Oil Tank is simply a tank within a tank. The fuel is stored in the inner tank and the outer tank acts as a failsafe so that in the event of a spillage, excess fuel will collect in the bund. They are a requirement at commercial, industrial and institutional premises. In some circumstances in domestic situations it is still possible to use a single skin tank (see below). All non-domestic oil storage tanks over 200 litres need to be bunded. Your tank is near an open drain or loose fitting manhole. Your oil use is for a building other than a single family dwelling. All oil tanks supplied by Fuel Tank Shop are manufactured from Medium Density Polyethylene (MDPE) - a material that displays excellent chemical and impact resistance properties, making it ideal for external fuel storage. Fittings vary according to tank type and supplier. However, in general fill points are made from either coated mild or stainless steel, outlets from coated mild steel, and vent points are manufactured from plastic. All materials used in the manufacture of oil tanks supplied by Fuel Tank Shop are resistant to the potentially damaging long term effects of fuel. Yes. Every oil tank sold by Fuel Tank Shop is manufactured from a material which incorporated UV inhibitors. These prevent UV rays from permeating the structure of the tank, thus preventing fuel degradation. Fuel Tank Shop can supply water absorbent packs (such as CIM-TEK Tank Dryer). Please contact us for more information or contact your local fuel distributor who will be able to provide advice on how best to remove it. Yes. It is important to replace older metal tanks as condensation, amongst other things, on the inside of the tank can cause corrosion, resulting in leaks and an expensive clean ups for the tanks owner. Most plastic bunded oil tanks come with a 10 year manufacturers’ warranty and when properly installed and maintained can last for many years beyond its expiration date. Fuel pumping and tank equipment usually comes with the standard manufacturers 1 year warranty. If the oil tank has a nominal capacity of less than 3,500 litres, it should not be placed any closer than 760mm to a boundary. This assumes that there are no flue outlets or buildings between the tank and the boundary. Where these distances cannot be achieved, the protection measures noted in OFTEC Technical Instruction Book 3 and British Standard BS5410 must be provided by means of a 30 minute fire resistant wall which extends a minimum of 300mm above and beyond the ends of the oil tank. For oil tanks with a nominal capacity of 3,500 litres or greater please contact your local Building Control Officer or OFTEC. Oil tanks with a nominal capacity of less than 3,500 litres should not be placed within 1.8 metres of a flue outlet. Where these distances cannot be achieved, the protection measures noted in OFTEC Technical Instruction Book 3 and British Standard BS5410 must be provided by means of a 30 minute fire resistant wall which extends a minimum of 300mm above and beyond the ends of the tank. Internal oil storage tanks should never be installed in a habitable area, and should always be contained within an enclosed chamber. Detailed requirements exist for the installation of oil storage tanks within habitable buildings and domestic garages. For more information, contact OFTEC. Oil tanks need to be installed by a competent person, if you do not use an OFTEC registered installer, you will have to contact your local building control. OFTEC is Oil Firing Technical Association for the Petroleum Industry. It was launched in April 1991 to construct a framework within which oil firing in the United Kingdom and Republic of Ireland could operate with a greater degree of technical expertise and efficiency. One of its first priorities was to set up a system of training and registration for Technicians engaged in commissioning, servicing, installation and plant operation with oil firing equipment. The scope of the scheme has since been extended to cover Technicians engaged in oil delivery. No. Please note however that some bunded tanks are pre-supplied with an electronic oil tank contents gauge, which removes the requirement for a sight gauge to be fitted. Electronic oil level monitors can be supplied separately for all other fuel tanks. This permits an LRC enabled delivery driver to plug in his overfill prevention equipment and is not for consumer use. The Tiger Loop is a de-aeration device which removes air from the fuel prior to combustion. The result is a cleaner, more-efficient burn, with reduced emissions and enhanced cold weather performance. Additionally, the Tiger Loop can permit the tank to be positioned lower than the burner and up to 30 metres away. Therefore when connected to a pressure jet burner, it is ideal for Top Outlet Bunded Tank installations and eliminates the need for an undesirable return line. Please note that Tiger Loops are unsuitable for use with installations incorporating a vaporising burner. Yes we do, however we would advise you to consider one of our Diesel Dispensers. For BioDiesel and AdBlue applications we also have a range of Bio Fuel Dispensers and AdBlue Dispensers produced in accordance with British and European Standards. Diesel (D) to British Standard BS2869. Additionally, all Fuel Stations, are also suitable for the storage and dispensing of BioDiesel with a bio-element of up to 8% concentration. No. However we can source these products. Please contact Fuel Tank Shop. You need to use a UN approved container often referred to as an IBC (Intermediate Bulk Container) and depending on the quantity of diesel, you will need to display orange plates and have certain safety equipment. AdBlue is the registered trademark for AUS32 (Aqueous Urea Solution 32.5%) and is used in a process called selective catalytic reduction (SCR) to reduce emissions of oxides of nitrogen from the exhaust of diesel engine motor vehicles. AdBlue is carried onboard SCR-equipped vehicles in specially designed tanks, and is dosed into the SCR system at a rate equivalent to 3 to 5% of diesel consumption. So basically, Adblue is a liquid chemical injected into the exhaust system of trucks, coaches and large commercial vehicles to help lower toxic exhaust gases. Adblue requires specific storage tanks and pumps as the chemical composition is quite aggressive towards mild steel and yellow metals. Also the temperature needs to remain above a certain level to keep the product within the designed specification. Pumps, hose fittings and nozzles are best manufactured from stainless steel or special plastics.